Weber brings you delicious, classic American barbecue sauce, straight from the popular Midwestern BBQ restaurant chain! With a well-balanced blend of sweet and savory flavors including red pepper, garlic, and molasses, this smooth, thick condiment is just what you need for perfectly caramelized barbecue meat and marinades that are to die for! 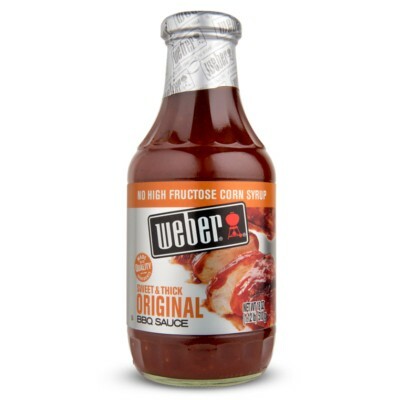 Try the classic Sweet & Thick variety today, and don't forget to take a look at our other sauces from Weber BBQ! Tomato puree (water, tomato paste), sugar, vinegar, salt, modified food starch, molasses, color E150, spices, natural hickory smoke flavor, thickening agent E415, onion, red pepper, garlic. Contains GMO. Un nouveau must-have pour les barbecues, sauce classique certes, mais on sent la qualité et ça fait la différence! I was looking for a decent barbecue sauce, this one is good, the smokey flavor isn't as strong which I like.